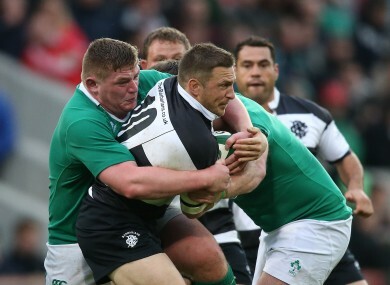 Furlong tackles Gopperth when Ireland met the Barbarians in 2015. FORMER LEINSTER OUT-HALF Jimmy Gopperth has heaped praised on prop Tadhg Furlong as he prepares to guide Wasps in a tough Champions Cup quarter-final in Dublin. Having only made his first start for Ireland last summer, the tighthead’s rise to the top with consistently excellent form has earned him acclaim far beyond just these shores. With Leo Cullen perhaps having to field some young, fresher faces for the knockout tie in the Aviva Stadium this Saturday, Gopperth was asked which of the academy crop impressed him most during his time there. He didn’t need a second’s thought to form his answer. “I always thought Tadhg Furlong would go on to greatness,” said the Kiwi, who departed Leinster shortly before Furlong made an international debut. He was a young fella coming through the academy, strong as an ox. He’s got that farm strength about him. “More than that, his attitude and the way he perceives himself. He’s a very humble guy, grounded guy and he’s come on leaps and bounds. He was outstanding in the Six Nations and he’s more or less booked his place in New Zealand with the Lions this summer. “Marty has fitted in really well with us. He had a couple of injuries early, but he shrugged them off and he’s been getting a lot of game time. “He adds a lot around the field and with his scrummaging and he has really opened up as a person. Email “More than just 'farm strength': Gopperth always believed Tadhg Furlong was bound for greatness”. Feedback on “More than just 'farm strength': Gopperth always believed Tadhg Furlong was bound for greatness”.